This course will be the second module class on crystal healing therapy and theory. We continue our path with the intermediate level to learn about sacred geometry crystals & layout, master crystals, advanced infusion layouts, dimension time travel, sound healing and much more. During the classes we will incorporate meditations, journey work, hands on healing, and lots of personal healing sessions. Explore the light language of sacred geometry and open up your clairvoyant centers, with breathing and gazing techniques, we use these ancient practices to help expand your Shamanic, Reiki & other healing practices. On the last month we will incorporate all the teachings into a one on one crystal healing session in order to complete the Intermediate program and receive your certification. 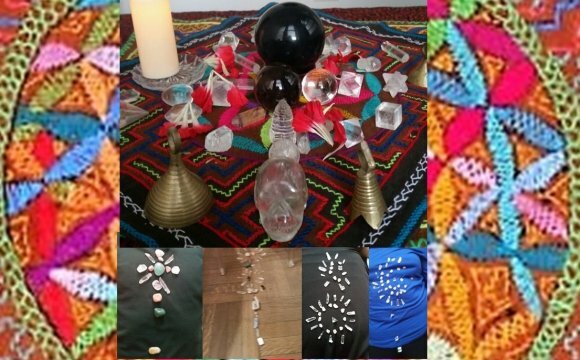 This Crystal Program is a 3 Module Certification Program, Beginners, Intermediate and Advanced Levels, at the completion of the 2nd level you will receive a Crystal Healer's Intermediate Certificate Level II from Shamanic Fire Reiki, LLC. Classes will be for 3 hours once a month for 9 months to complete each level. Within the Intermediate level we will learn the chakra system using sacred geometry and relations to the crystal body layouts. How to clear, program, charge and amplifying crystal energy. If you have more inquires of each of the monthly program please email for me for more information. March 26, April 30 & May 28th at SFR Soul Haven, 56 West 45th Street, Suite 1703, Midtown, Manhattan. A Registration Deposit of $722 by June 1st followed by 2 payments at $361.00 due in Nov. & Feb. Important: Make up classes will be available for an extra charge of $175, inquire within. (*Note only 3 makeup classes allowed). No Refunds for Deposit or for the Crystal Intermediate Level Course. I want to take this time to thank All my MedicineWay Students & Healers which have taught me how important this work is and how important it is to be to mix in with other healing modalities. Thanks for allowing your intuition to fully evolve and open me up to be able to guide you to what we both needed to explore. Thanks for your support and trust. As a Medicine Woman/Reiki Energy Healer I love using crystals within my work, now it's time to expand it for others to really take their passions of crystals to a deeper healing level. Are You Ready, to move forward and explore and continue your path as a crystal healer?